Trivia: Kerber and Makarova, who play each other today in one of the toughest first round match-ups in the women’s draw, are the only two lefties ever to pull off a very rare feat - what is it? 1. This is the 50th French Open of the Open Era. The 1968 French Open wasn’t just the first French Open of the Open Era, either - it was actually the first Grand Slam event of the Open Era! 2. The French Open’s “Sunday Start” has been around since 2006. The first one took place on Sunday, May 28, 2006. The French Open is actually the only Grand Slam to play on three Sundays (the Australian Open and US Open play on two Sundays while Wimbledon only plays on one). 3. Kvitova’s back! First on Chatrier is Kvitova, who’s playing her first match of the year. In the off-season she was attacked in her home by a man with a knife, suffering cuts on the fingers on her left hand - after surgery and months of rehab she’s back. Her last match was on November 12, 2016. 4. Kerber’s No.1, but two women could take that from her here. Kerber, who plays Makarova in her first round match today, is defending her No.1 ranking from Pliskova and Halep here - Pliskova needs at least a final and Halep needs at least the title (it depends on Kerber’s results as well). 5. There’s no race for No.1 on the men’s side, though. Murray will stay No.1 no matter what. 6. 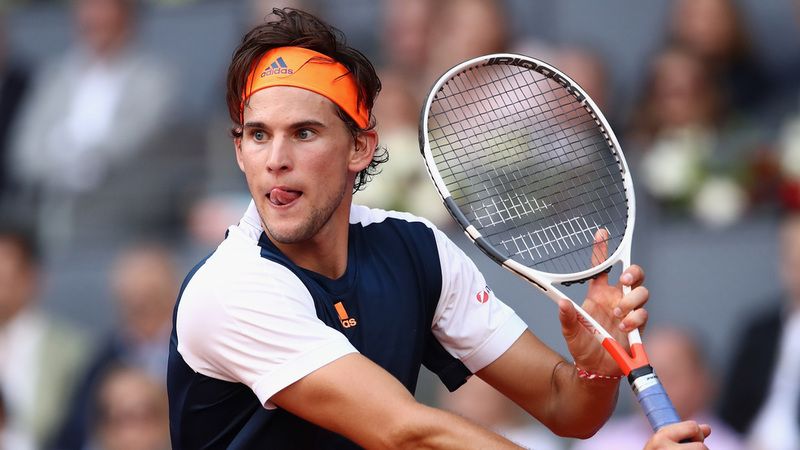 Thiem is the highest-ranked man in action. Thiem, a semifinalist here last year and the No.6 seed this year, could be very dangerous here - he’s actually the only player to beat Nadal on clay in the last 12 months, beating him in the quarterfinals of Rome two weeks ago. He faces Tomic today. 7. It’s been a while since Venus was at a major without Serena. The last time Venus was the only Williams at a major was the 2011 Australian Open (that was during Serena’s year-long injury and illness lay-off - Venus reached the third round before retiring against Petkovic with a hip injury). 8. Venus has almost as many majors as the rest of the field combined. She has seven, the rest have nine (Kerber, Kuznetsova and Kvitova two each, Muguruza, Schiavone and Stosur one each). 9. Lucic-Baroni continues to rewrite her story. In Australia, the Croat reached her first Grand Slam semifinal since last millennium. Here, she’s seeded for the first time ever at a major - at age 35. 10. Today’s winners are guaranteed two days off. They won’t play again until Wednesday.